Hello! I'm back with another 'Fashion over Fifty' Post. If you missed it, you can read my original post about my new blogging endeavor HERE. I'm in love with all the new bright colors this season, but, like everyone else, I worry about the colors being 'too much' and thus standing out a bit too much in the crowd than I care to, and/or what to wear with them. The best way to wear bold, bright, colors is to tone them down a bit with a neutral like beige, white, or black. So I paired this new shirt I just received from Stitchfix (for those of you that have never heard of Stitchfix before, I plan on having a separate post about them on a later date to explain more) with a pair of shiny, black, sateen Capri's from J.C.Penny. I normally would have chosen a pair of black shoes to wear with black pants, but one thing Stitchfix taught me was to pair a different colored shoe, or use a neutral like the one I'm wearing. I really like the way the beige sandal from Famous Footwear looks with the coral shirt and pants. The shoes were purchased last year, but HERE'S a current style that is quite similar to what I own. And by the way, the shirt is not this light in real life. It's much brighter, and the best way to describe the color would be to say 'coral'....even though I realize lots of pinkish/orange tones fall into that color description. I really like the way this shirt fit me. It's kind wrinkly in the picture because it was taken after a long day (lesson to self: try to take pictures at the beginning of a day...not the end) but it is comfortable to wear and I love the neckline and the way the fabric flows down the stomach helping to hide those unwanted pounds. For my necklace, Stitchfix suggested wearing a jade colored necklace with this blouse. But all my jade necklaces were too long, so I chose this handmade seashell necklace that has both jade and coral tones in it. I made it myself in a beading class that I took at JoAnn's Fabrics and Crafts. This double strapped watch was the only item I purchased on my vacation to Missouri. I paid only $10.00 for it at a cute jewelry boutique in Eureka Springs, Arkansas. I really love it. The cobalt blue goes with just about everything, and I really love the uniqueness of the double strap. On my other arm, I wore a Jade Bracelet I purchased at JoAnn's Fabrics and Crafts. Yes, they sell pre-made jewelry too. One thing I'm struggling with from a design sense is wearing jewelry on both arms. I think it's only aesthetically pleasing to wear jewelry on one wrist, leaving the other wrist bare. But, I like to wear a watch, which leaves me with dilemma of do I wear a watch and not a bracelet or both? I've paid a lot of attention to this on fashion blogs, and there does seem to be a lot of pictures with women wearing bracelets on both arms. What are your thoughts? 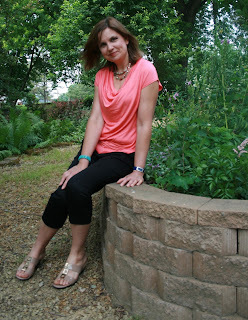 I hope you enjoyed my second 'Fashion for Women over Fifty' post. I sure do enjoy writing them. Love the blouse style and the colour, for me I would want a little longer sleeve. The pants and shoes look great with your outfit and as for wearing jewellery on both arms, not for me, but I do wear a watch on one arm and a bracelet on the other. Is that the same thing? To me it seems different.